The Supreme Court bench led by Justice Ranjan Gogoi on Wednesday dismissed Advocate Kamini Jaiswal’s petition seeking a Special Investigation Team (SIT) probe into the incidents of attacks on then JNU student union leader Kanhaiya Kumar on 15 and 17 February, 2016, at Patiala House Court while he was escorted to court room in a sedition case. “We don’t want to flog a dead horse back to life. We don’t like to proceed further and we are not inclined to continue with the petition,” Justice Gogoi said. Bhushan, however, sought the bench to initiate contempt proceedings against three lawyers and erring policemen for flouting the apex court order, which was rejected by the bench. "Needless to say that the present order does not prevent the petitioner from taking appropriate action in accordance with law, if so advised. We have expressed no opinion on merit", said the Bench in the order. In the plea, Jaiswal had also sought a direction to issue suo motu contempt proceeding against three advocates, accused of interfering in the administration of justice and for willfully violating the orders of the Supreme Court dated 17 February, 2016. These advocates reportedly led the attacks in the incidents. The petition also cited the reports submitted to the Supreme Court by senior advocate Ajit Kumar Sinha, who had gone with a team of five senior lawyers, the Registrar General, High Court of Delhi, and the Delhi Police on the incidents. On 12 February 2016, then Jawaharlal Nehru University students' union president Kanhaiya Kumar was arrested on the charge of sedition for holding an anti-national event inside the university premises. He was attacked allegedly by the lawyers during his production in the Patiala House Court on February 15. The lawyers had also allegedly assaulted journalists. 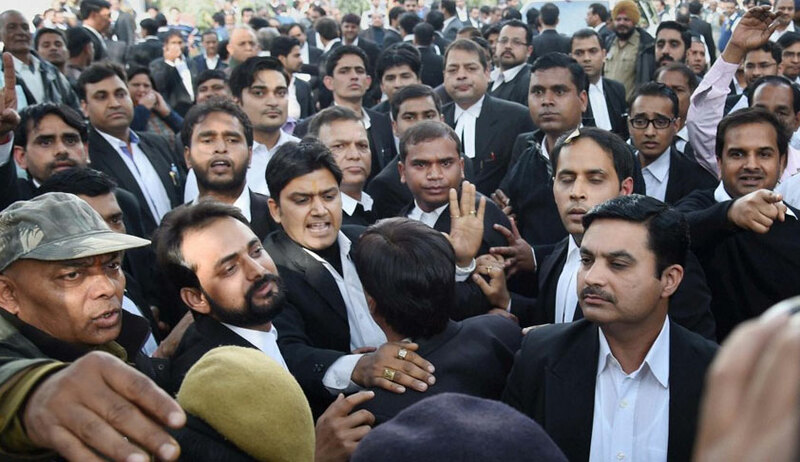 Subsequently, with the intervention of apex court and its directions to Delhi Police to strictly maintain law and order in the court complex, the incident was repeated on February 17. Earlier, the bench had disposed of another petition which was filed by ND Jayaprakash, an activist and JNU alumnus, for the protection of Kanhaiya and tightening of security around the court complex.